When we should use inner join? When we should use a subquery? Which one will faster in SQL server according to query performance? These are common questions when we need to get data using more than one table. There is not a straightforward answer to these questions. Here we will discuss many aspects of this. 1. Use joins when we need to get data from both the tables in a SELECT statement. Here we cannot include fields of table tblEmpDetail in a select list. So if we need to get the data from fields of both tables join is the only solution. It is not possible by the subquery. When we need to get the data from only one table by checking the existence in another table then it is possible by both joins as well as a subquery. In this case which one will perform better inner join or subquery? 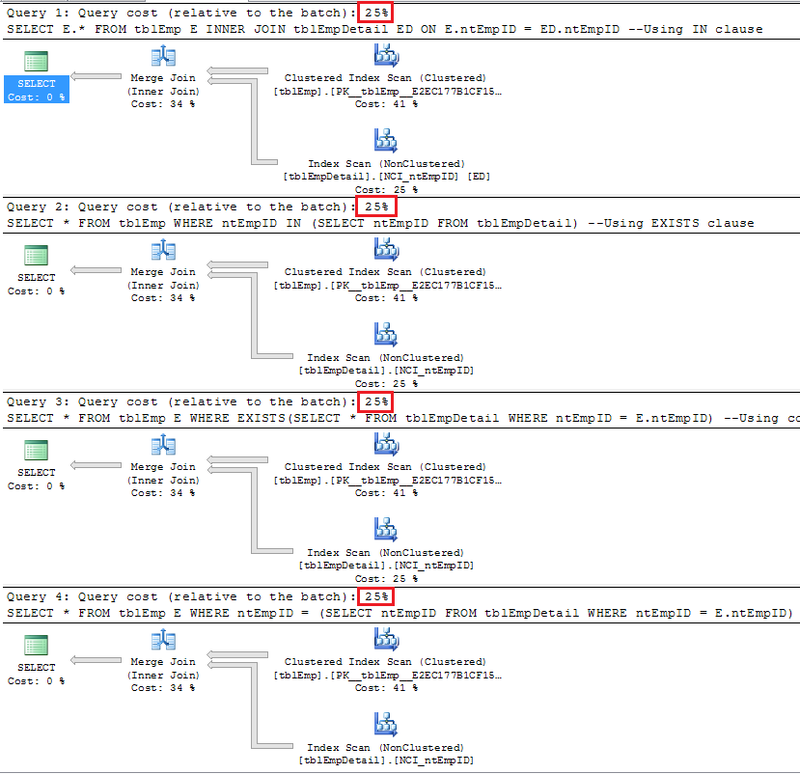 Query 1, 2 and 3 have same execution cost while query 4 is costliest. 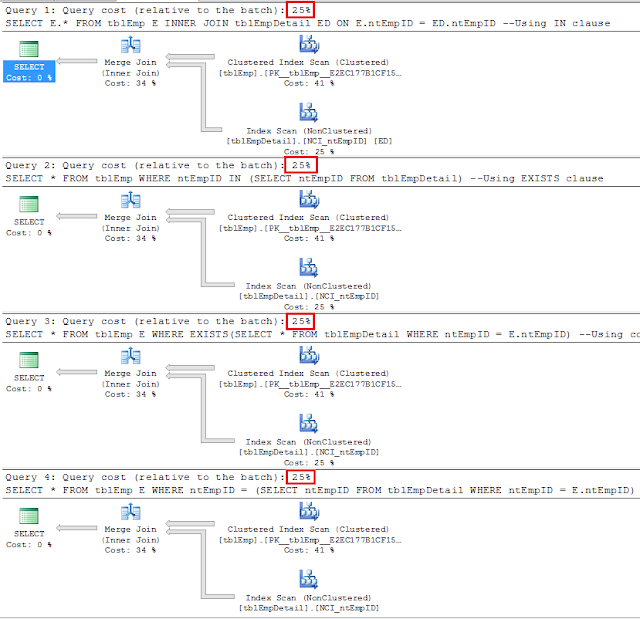 Also, query 2 and 3 have an exactly same execution plan. Let me explain it one by one. Why query 4 is costliest compare to others? SQL server doesn't know how many rows will be returned by this subquery. If it is more than one then it will throw an error: Subquery returned more than 1 value. This is not permitted when the subquery follows =, !=, <, <=, >, >= or when the subquery is used as an expression. 1. Index spool: It creates a copy of a table in tempdb which satisfy WHERE ntEmpID = E.ntEmpID and create an index on it. Conclusion: Never write subquery with equal to an operator for this scenario. Now if you will check the execution plan, you will find all four queries have equal execution cost (25%). Operator Inner Join can get data from both tables while operator Right Semi Join can get the data from an only right table. 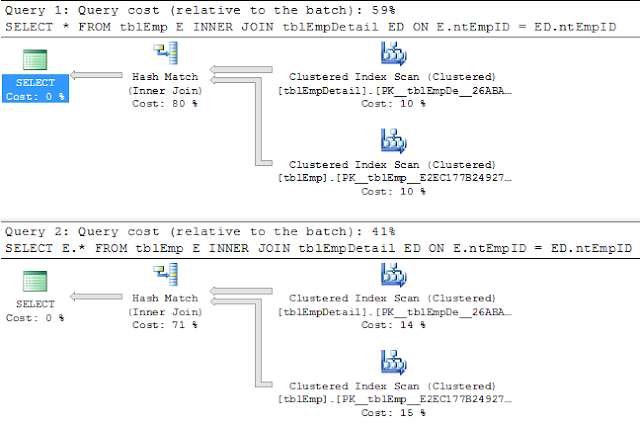 Definitely Inner join 1 will more costly than inner Join 2 since it is selecting more numbers of columns. Is there any other difference between inner join and subquery except inner join get data from both tables while not by subquery? Now in this case subquery is performing better than inner join. Now, both the table has one to one relationship for ntStuID. That is one student has one detail and one details belong to one student. Note: But SQL server doesn't know both tables has one to one relationship. To tell SQL server, we have to create a unique constraint in ntStuID of both tables. We can do it by making it unique key, Primary key or by creating a unique index. We will get an exactly same output of both the query. 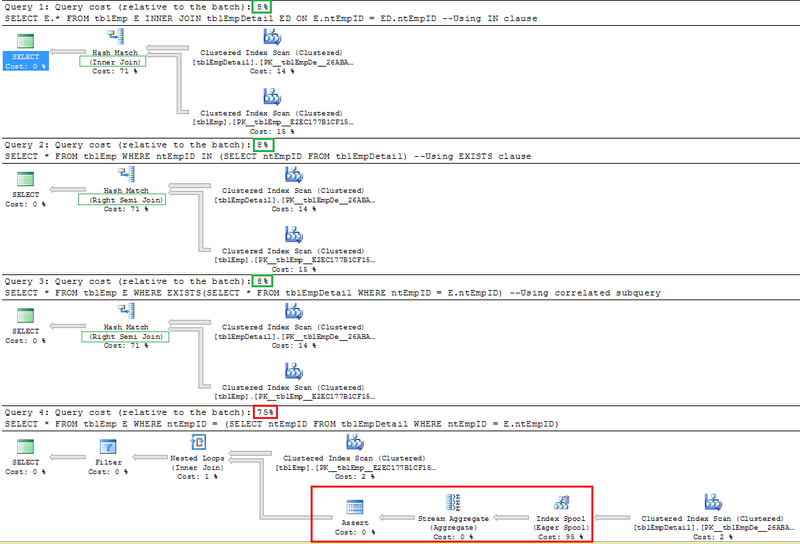 Note: Again SQL server doesn't know both tables has one to many relationships or not. To tell SQL server, we have to create a unique constraint in ntStuID in only one table. We can do it by making it unique key, Primary key or by creating a unique index. Now inner join is returning more records than a subquery. Both queries have different output!! How can we compare the performance if both queries return different output? They are two different queries. Note: If two tables have not any primary key, unique key or unique index on column SD.ntStuID, SQL server assume both tables have many to many relations. Again, inner join returning more records than a subquery. Also subquery returning duplicate recodes. Both queries have different output. In this case, we cannot compare the performance between subquery and inner join since both queries have different output. Question: If two tables have one to one relation for a key column and we want to get data from only one table in this case inner join will perform better or subquery? Answer: As I know the performance of both the query will exactly same. Till now, I didn't find any differences if you please share with us. 1. If we need the data from both the tables we must have to choose inner join. If we need data from only one table then we can choose either subquery or inner join. 2. If two tables have one to many, many to one or many to many, subquery and inner join may have different output. So choose according to your application requirement. An SQL server query optimizer is smart enough that it will choose same execution for all. Otherwise, it will decrease the performance or cause of an error. So you must have to use a subquery. So, technically there is no difference between inner join and subquery. We will get an error message: Incorrect syntax near 'SD'. We get wrong output without any warning. The worst thing is if one or both table has too many records this query will be too costly and locked the both table for a long period of time. So I suggest don't write join query in the old way.